We love genuine Tiger Eye. 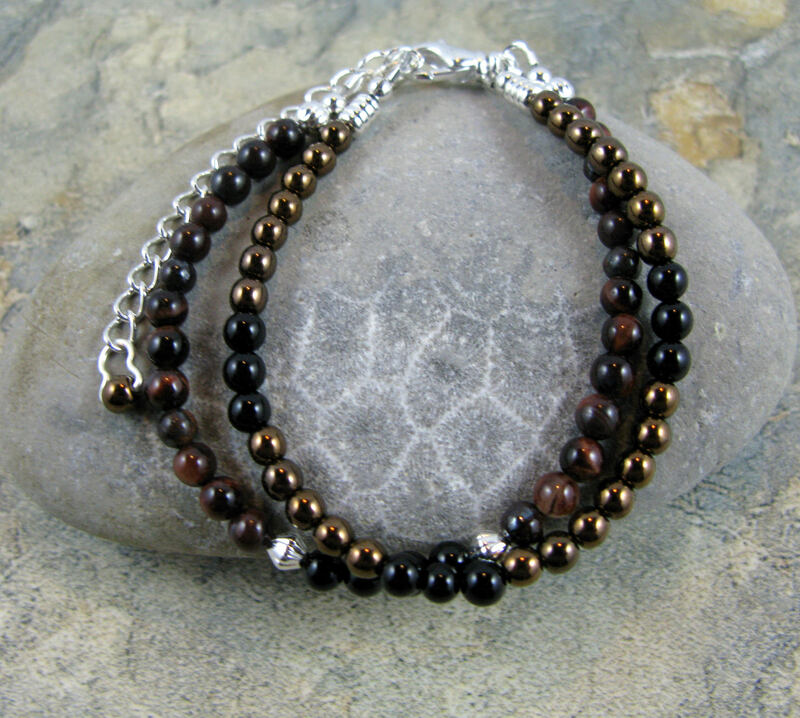 This dazzling bracelet is made with tigers eye and black onyx gemstones and copper Czech glass beads. The bracelet is 6-1/2 inches long and comes with a 2 inch chain so you can adjust the bracelet to your desired length up to 8-1/2 inches. All beads are 4mm. The accent beads and findings (except crimps covers which are sterling silver) are silver plated. This bracelet was designed and handmade in our studio and is unique. You will receive the pictured bracelet. Each bracelet comes in its own gift box. We gladly accept Direct Checkout and PayPal. We are sorry but we do not accept checks or money orders at this time. Refunds and Exchanges: If you are happy with your purchase please remember to leave feedback for us on Etsy. If you are not happy, let us know and we will make every effort to correct the problem. If you are not happy, we aren't. You may return or exchange your items if you are not happy with them for any reason as long as you contact us within 7 days after the delivery. If your item becomes defective at any time within one year of purchase, please feel free to contact us regarding a replacement. After determining the cause of the problem, if it is clearly a quality issue on our end, then we will happily replace the item for that item or an item of equal value at no extra charge to you. If you would like a replacement item of greater value, you would need to pay the difference between the two items. We cannot be responsible for damaged and/or lost packages. If you would like your purchase insured, please contact us for an adjusted invoice upon purchase. All packages are shipped with delivery confirmation except for International shipments. DOMESTIC: small orders are sent USPS First Class with Tracking. Larger orders can be sent USPS Priority Flat Rate with Tracking. PLEASE be sure your Etsy address is the correct mailing address, as that is the one we will use unless you inform us otherwise. We are now accepting wholesale orders. Please contact for additional information.